Home > About SFWA > Join Us > Why Join SFWA? These are few of the ways in which Science Fiction and Fantasy Writers of America can help you as an individual writer. We can help you promote your work through activities like the Featured Author and Book programs, the PressBook, or QuickUpdates. The Grievance Committee (GriefCom) can help resolve contractual disputes. The Emergency Medical Fund can help you with unexpected medical expenses. The private discussion forums offer a chance to talk shop with your peers in the industry. SFWA offers members a sense of community, no matter where you live or what you write. SFWA’s work on the Google Book Settlement issue. Negotiations with publishers to improve industry standards. Through our members, we can improve conditions for writers within the Science Fiction and Fantasy genres. Simply joining and adding your name to the roster is one of the easiest ways to follow the tradition of paying it forward. The stronger SFWA becomes, the more effective it can be in advocating for writers. 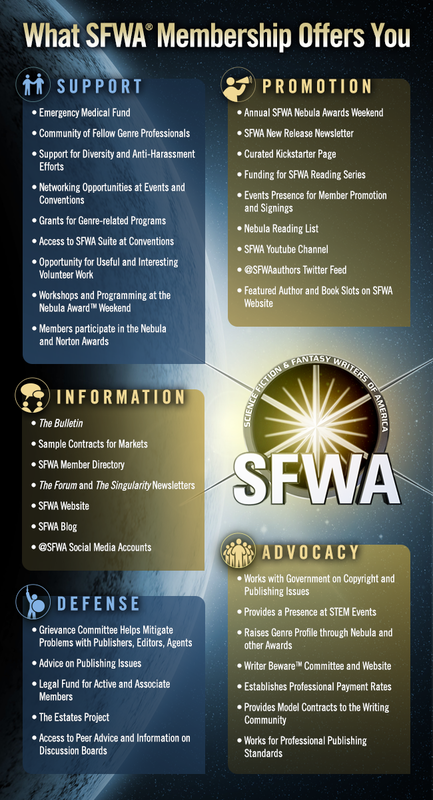 Does SFWA sound right for you? SFWA membership is open to authors, artists and other industry professionals, including graphic novelists. See if you qualify. Want to join SFWA? Our online Application Form takes just a few minutes to complete.